Hope rock found in Toronto, Canada! Last Christmas we had beloved friends from Canada spending the holiday with us. On their way back home I gave some word rocks to their beautiful daughter Dora so she could spread them throughout Toronto. One of the rocks was found and the person wrote today telling me her beautiful story and connection with rocks and positive words. What a wonderful world! I have long been a big fan of words on stones. I've used them as a counselling tool, and as reminders for what's good. Sometimes I've written words on rocks for myself, or for friends. Sometimes family and friends have written words on rocks as reminders for me. 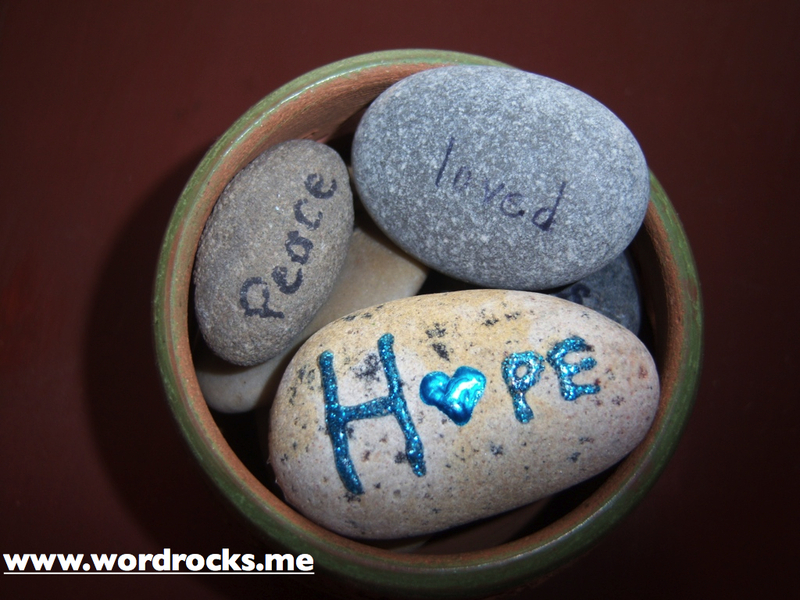 One evening a few weeks ago, I was on my way home from visiting friends, and I found a Hope rock under a bench, with http://www.wordrocks.me on the back of it. I was thrilled. I tried to give it to the friend I'd been visiting that night, thinking maybe its message was for her, but she insisted I keep it--that it was for me. Checking out your site I found your request to send a photo of said rock. I tried out a few different shots until I found the right one: in a bowl with other stones I'd been sent, stones with words of encouragement when I needed them. A few days ago I walked by the parkette where I'd found the Hope rock, and the bench was gone. Where did it go? Had I dreamed it? But I hadn't, because I've got the rock, alongside other ones I love. Thank you so much for this wonderful project.